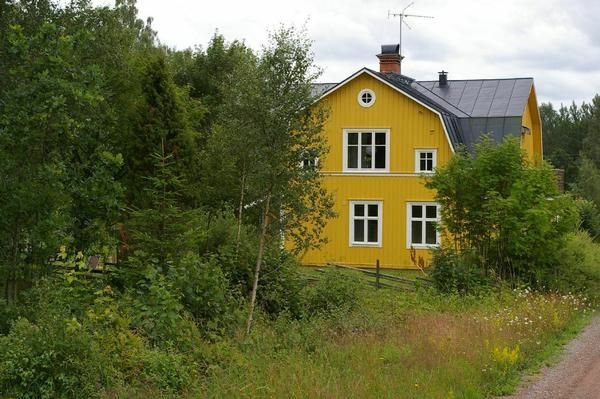 Renovated, spacious holiday home, located on a road about 1 km outside the small town of Pauliström, in the middle of the nature of the highlands of the Smaländ. The 1. 300m2 large garden invites you to linger. The stately rooms of the old village store exude an elegant yet cozy atmosphere. Here you can enjoy the holiday. Whether in the living / dining room with south orientation or in the north-facing kitchen, from which you can watch deer and rabbits in front of the forest. All rooms have beautiful tiled stoves. The sights around the stories from Astrid Lindgren's books are reached in a few minutes by car (Mariannelund about 20 km, Vimmerby about 44 km) and if you are looking for adventure, it can be z. B. at the approx. 17 km distant Goldgräberstätte find. The small community of Karlstorp is well known for its beauty, so it is worth discovering the surroundings. The house is located on a road from which the red gravel roads lead to small forest villages. Here you can imagine how Michel and Co. used to live - time seems to stand still! A special feature: The bedroom on the ground floor is air conditioned. Two bedrooms (parent / child's bedroom) and the bathroom are on the ground floor, the remaining living rooms and one bedroom are upstairs. A final cleaning can be booked additionally (75,00 EUR). Nearest (small lake) in about 1 km distance. Distance to the lake Ramsen with large bathing place and sand beach approx. 2.5 km, bathing lake Flen with nature bath place in the middle of the nature reserve in a distance of approx. 2,0 km. Here there is also the possibility for fishing (fishing license can be purchased locally cheap (about 25.00 EUR annual pass), boat can be rented locally cheap (about 7.00 EUR / day)). 2 bicycles (incl. Child seat), books, toys (indoor / outdoor), high chair, playpen, travel cot, television with German satellite TV and DVD player, stereo with CD player, fireplace in the garden, 2xGrill, garden furniture for 4 persons, a fishing rod. Furthermore, there are some books in the house (children's books, thrillers, etc.). From the house are quickly supermarkets, doctors and banks to reach (about 16km). A smaller supermarket is about 10 km away. Here is also a gas station, a restaurant and a garage. The WLAN is 2.5 GB / week included, the scope can be extended for a small fee. Schönes Haus in malerischer Umgebung. Wir haben zwei wundervolle Wochen hier verbracht und genug Platz für 4 Erwachsene und 3 Kinder gehabt. Das Haus hat alles geboten was man für einen sorgenfreien und erholsamen Urlaub brauchte und wir haben viel Zeit draußen im Garten verbracht. Die Gegend ist sehr interessant und wunderschön.